January 17, 2019, © Leeham News: It’s all about the new Airbus A220 on the North America press tour Airbus is hosting this week. Airbus got this top modern aircraft as a windfall after Boeing tried to block its sale on the US Market in 2017. While the tour presents the A220 in the best of lights, it can’t shine brighter than Airbus’ own A320neo. The graph from the tour which positions them in capacity and range shows a clear little brother-large brother relationship. The reality, when comparing apples to apples, is another. Figure 1. 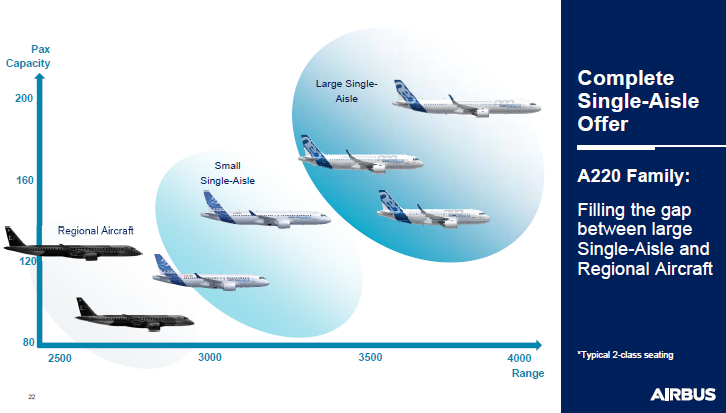 Airbus payload-range chart with the new A220-100 and -300 placed as shorter ranged than the A320neo and A321neo. The ideal positioning of the A220 and A320 is when the larger models are higher in capacity and flies further. They cost more and shall, therefore, be better. But the comparison is not made with the same yardsticks. Use the same rules and the result is another. The more modern A220-300 can then give the A320neo a match both in range and fuel consumption per passenger.